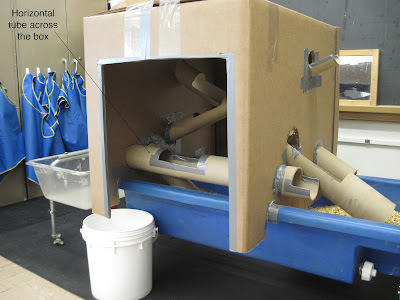 This is a blog for early childhood teachers looking for ways to expand and enrich play and learning in and around their sand and water tables with easy-to-make, low-cost apparatus. It may also be of interest for anyone who appreciates children's messy play. Early childhood education has been my life for over 30 years. I have taught all age groups from infants to 5-year-olds. I was a director for five years in the 1980s, but I returned to the classroom 22 years ago. My passion is watching the ways children explore and discover their world. In the classroom, everything starts with the reciprocal relationships between adults and children and between the children themselves. With that in mind, I plan and set up activities. But that is just the beginning. What actually happens is a flow that includes my efforts to invite, respond and support children's interface with those activities and with others in the room. Oh yeh, and along the way, the children change the activities to suit their own inventiveness and creativity. Now the processes become reciprocal with the children doing the inviting, responding and supporting. Young children are the best learners and teachers. I am truly fortunate to be a part of their journey. Last week's post introduced the apparatus Big Box on Top. In that post, I noted that the space inside the box was so inviting that children actually crawled into the box and sat in the table. I kept this apparatus up for a second week with one modification: I added a cardboard tube that transversed the box horizontally. The reason I added the horizontal tube was to prevent children from climbing into the box and into the table. Did it work? Are you kidding me? How many tubes will it take to stop them from crawling in? I really do not have a problem with the children crawling in. Still, I wanted to see if I could stop them from climbing into the box. As you see, my experiment did not work. Silly me! Putting aside the crawling in and out, the apparatus spawned a multitude of operations as the children played and explored the apparatus. One of the simplest operations---it is actually a set of operations---is to fill a container and then pour it down the tube. Watch how that works with these two-year-olds. If you take the time to analyze the video, this simple operation turns out to be quite complex. These two are filling their measuring cups with other containers before emptying their cups down the tube. That in itself is not so simple. Each child has a different container to fill his cup and each container has a different shape and size which makes each act of filling the cup a little different. And why do they have to fill their cup with another container in the first place? Why don't they just scoop corn out of the table with their cups? As far as pouring, did you notice the amount of effort it took for them to stretch to be able to pour the corn down the highest tube. We have not even begun to mention things like eye-to-hand coordination, muscle control, language, etc. Pouring corn down the tube becomes a social operation when someone is on the other end. Watch. These three boys have coordinated their play. They are connected by the tube and they each have a role to play. You can have the pouring and the catching as separate activities, but the boy in orange gives us a clue that it is social by checking the tube to see if the flow of corn is being obstructed by his friend on the other end. If the video were longer, you would see clearly just how social. Sometimes that social play involves a fair amount of negotiation, coordination, and give-and-take. You can see that in the pictures below. There is more negotiation here than meets the eye because before long the roles are reversed. The boy who was inside is now outside catching the corn while the boy who was outside is now inside pouring the corn. How did that happen? Through some serious coordination and give-and-take. There are so many of these operations that arise from play with this apparatus. Too many, in fact, to continue documenting in this post. There is one more, though, that seemed to come out of nowhere. Watch. The boy in the video seems to be paying a lot of attention to me, almost as if it is a performance. In a way it is, because when I saw what he was doing, I asked him to do it again. He had no trouble recreating his operation. But what prompted this child to dump his dustpan backwards? Some questions arise for which there are no answers. They are simply fodder for reflecting on the wonderment of children and their operations. P.S. School is out for the summer so I will be taking a break from the blog for July and August. I will use the time to fine-tune a presentation on sensory tables for the annual conference of the National Association for the Education of Young Children in Atlanta this November. As I plan for that presentation, I would like to ask for your help. Do you have questions about any apparatus or the process of building apparatus that have come up in the course of reading this blog? If you were to go to my presentation on sensory tables, what would you want to see or hear? Also, if you have tried to make an apparatus from the blog, which did you try and how did that work for you? The best way to learn is to do, but are there some tips that would have helped you in the doing? Also, if you thought you were going to build something you saw in the blog but did not, what gave you pause. Oh my gosh! This is inspiring. How cool. Thanks for including the videos! I am now thinking how we can incorporate activities like this. Thanks for sharing these great ideas! This looks pretty awesome, the kids surely seem to enjoy them selves aswell. This was an amazing idea that kid's will love love play. It looks like real apparatus that perfect for the kid's who wants discoveries. When building apparatus for the sensory table, think in terms of the dimensions and elements listed below. Using the different dimensions and elements exponentially expands what can be built in and around the table. The incline can vary in degrees from slight to great. Levels are important for children to experience space. This follows from #2 and #3. Create spaces over, under, around and through the table. The spaces can be of various sizes to encourage exploration. Children need to put things in holes. Make holes of various sizes and shapes and on various levels. 1) Children need to transport whatever is in the table out of the table. During the transporting, children will spill. 2) Children will explore all spaces in any given apparatus no matter how big or small. More spaces equals more exploration. 3) Children will find all the different levels of play for any given apparatus. Children will use all levels of play including the highest and the lowest---which includes the floor. 4) Children are naturally drawn to pouring, rolling, or sliding materials and objects down ramps, chutes, and tubes. 5) Children are compelled by nature to put things in holes. Children will find every hole in and around an apparatus no matter how big or small. Children, whenever possible, will modify the holes of any given apparatus. 6) Children will try to stop or redirect the flow of any medium in the table for any given apparatus. Children, whenever possible, will try to completely block the flow of any medium. 7) Children will always devise new and novel activities and explorations with the materials presented that are tangential to the apparatus itself. 8) Children will fill any and all containers with the medium or materials provided. Children need to empty any and all filled containers. 9) Children will pursue their own unique physical challenges when working on, at or next to an apparatus. copyright @ Thomas Bedard 2008 -2018. Simple theme. Powered by Blogger.